A dental implant is a titanium “screw” that replaces the root portion of a missing tooth. It is the closest thing to behaving like a natural tooth other than a patient’s natural tooth. In cases where there is not enough bone to support the implant, a bone replacement graft (cow bone or sterilized cadaver bone) is used to supplement the patient’s bone and build new bone. We have a 3D x-ray machine in our office (CBCT) which is often used to determine whether enough bone exists for implant placement. Once the implant has been placed, bone heals around the threads of the “screw” and locks it into position. 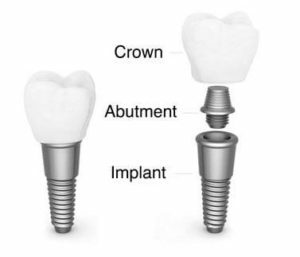 At that point, an abutment (similar to the “crown-prepped” portion of a tooth) can be attached to the implant, followed by a crown. The implant and implant supported crown can then be cleaned just like a natural tooth.